Lying at the northwestern foot of Mt. Lushan, the temple, built in 386, is the cradle of Sukhavati Sect. 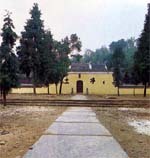 Jian Zhen, an eminent monk of the Tang Dynasty, once stayed here on his way Japan to spread Buddhism.